Austin has continued to grow and thrive even as much of the rest of the US has experienced problems with unemployment, the housing market and/or an exodus of residents. Austin's housing market has slowed its pace a bit but is still quite healthy thanks to the continued arrival of new workers and their families. Austin's position as a city to work and live in is so good that it is expected to grow more (relatively) than any other major US city over the next several decades. That's bad news for job commuters but great news for homeowners. If you're thinking of living in Austin for the long term it's probably hard to go wrong with buying property in any corner of the city. If you have your heart set on a property that is "centrally located" you're probably in for some sticker shock when it comes to those downtown/Tarrytown housing prices, even for the smallest of homes. A restored two-bedroom, one-bathroom frame house on a tiny lot can easily command over $200 per square foot. If you decide you can't afford something downtown then you may wish to turn your attention to something closer to the actual center of Austin. Downtown Austin marks the city's activity center by providing the highest concentration of places to go and things to do. The population center, however, is a full 10 miles from downtown. This area is more central to housing, major roadways and technology jobs. Unlike those properties bordering downtown, prices for properties in and around the population center are still somewhat reasonable as they have not realized their full potential value for being central to the greater Austin area. 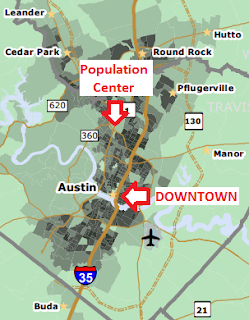 So where is the population center of the greater Austin area? The City of Austin divides the city into seven "planning areas". For the past decade the population center has fallen within the area the city labels as "Northwest Austin" -- specifically, near the Arboretum shopping complex at the intersection of 360 and 183 (map). This population density map of Austin is not overly detailed but even without fine detail it's easy to see the population pivots around an area well north of downtown. A healthy 31% of Austin residents already reside in northwest Austin. Big north-Austin employers such as IBM, Dell, the University of Texas and countless smaller tech employers have helped insure that a sizable contingent of well-paid tech professionals tend to seek out and stay in north-Austin housing...or pay a heavy penalty in commute time. Just to keep things nicely geeky, here are a bunch of numbers. Enjoy. Austin is now the 13th largest US city with an official census population of 820,611. The greater Austin area is more than double that figure. On average over 150 people move to Austin each day. With regards to other major US cities this marks Austin as the fastest-growing city in terms of growth per capita and explains the current 96% occupancy rate for apartments. Austin's cost of living index is 7.2% below the national average. Yes, on average it is actually cheaper to live in Austin compared to other US metro areas. Austin's median household income is 10% higher than the US average. Cheaper to live here + earn more money = very happy residents. Austin boasts 30% more college grads on average than other metro areas. Also 30% more graduate-level degrees. Having the 5th-largest public university in the US bordering the downtown area is probably a contributing factor. "Best Of" lists: Austin has appeared at or near the top of countless "Best city/place for..." lists. As much as I like Austin, I think such lists illustrate a good bit of irrational exuberance for the city at a national level. Although typically flattering for the city I'm not a fan of such lists. At best the lists are largely subjective. At worst, blind ratings criteria can combine to produce awful results like this one. Public transportation, public schools, utilities, water supply, public welfare... meh, Austin still has plenty of issues to keep it busy while it enjoys the benefits of continued growth. The city does a very good job on plenty of things -- just not consistently well across all areas of the city. * Many of these numbers are borrowed from the Austin Chamber of Commerce.